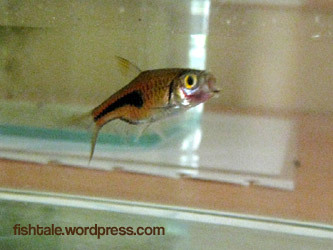 Xiao Hua was one of the four goldfishes we bought in May 08, 3 months from today (see A New Beginning…). 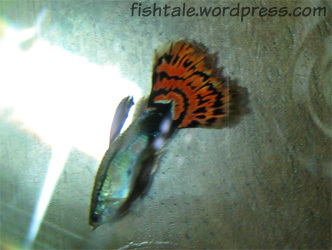 We chose her out of the many goldfishes at the fish farm because of her unique colour patterns; she looked like she was wearing a flowery mask for an opera show, and that was why we named her as so (小花), which represents ‘flowers’. A few weeks after her arrival, we noticed that she was having some floating problems (see Tanks and Fishes Updates) and thought we would lose her then. However, she continued to survive without any problems, and was always very lively, especially during her feeding times. 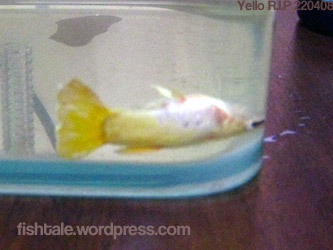 So it was unfortunate that she was still the least healthy of the four goldfishes, and her time had come. It was yesterday morning that my wife Cat started noticing Xiao Hua being sucked close to the filter inlet, and hardly swam around. By the time I reached home, she was lying below the plants, almost motionlessly. It was until this evening that I found her completely motionless and not breathing by the filter, with her tails broken off at some parts. Hopefully this is not the dreaded fins/tail rot disease, as it’s contagious and (touch wood!) 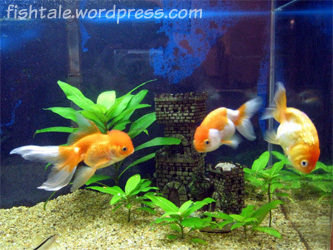 could have passed on to the remaining three goldfishes. 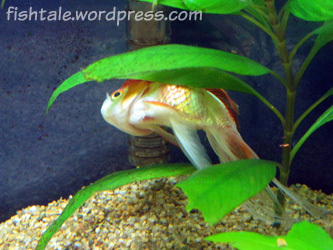 Our male Gourami and one of our Rasboras were found dead today. We have scooped up the surviving fries previously, so I wonder if it was due to stress/depression he suffered after finding out that the fries that he so dearly protected were gone? Or was it due to my ‘imprisonment’ overnight that caused him to be stressed out? This morning, before I left for work, I did notice a long stringy white poop coming out from one of the female Gouramis. This was a sign of internal parasite, but I was in a hurry to go for work so did not quarantine her. Linking the death and her parasite issue, I wonder if it is due to our tank parameters going haywire? Need to conduct pH and Ammonia tests tonight. Another reason could also be due to the recent increase in our snail population; the dwarf loaches have been lazy in eating up the snails, as they had been enjoying the sinking pellets we dropped in during meal times for the Corydoras, SAE and Garra. We have read that snails might carry parasites which might pass to the fishes. On another related/unreleated issue, one of our Rasboras had an injury to his jaw, causing it to swell up and he had to maintain his ‘mouth opened’ pose. 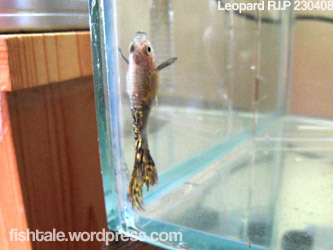 He was swimming weakly and although we managed to quarantine him, he died a few hours later. 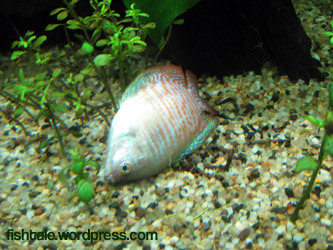 The reason to his death is still unknown, though I suspect it could be injuries while he was swimming away from the male Gourami’s attacks previously. It has been a while since we updated on the status of our Guppy Tank, one of the main reasons being an epidemic had broken out in both our tanks since beginning of May. 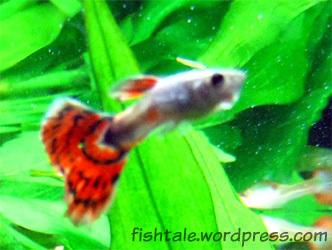 Guppies started dying one after another, mainly suffering from fin and tail rot diseases. 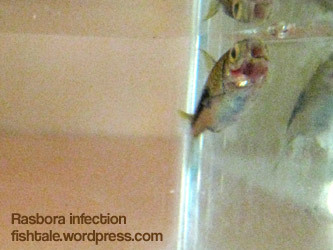 We tried to rescue the initial infected by isolating them into quarantine tanks and treating them with salt and Melafix, but those did nothing to help them. Then the disease started to spread rapidly in both tanks simultaneously, the link between them unknown. The only similarity that we could determine was we stopped introducing Benefiical Bacteria and Vitamins solutions during each water change, since both had run out at roughly the same time. We thought the Ocean Free New Water solution would be sufficient to provide healthy and dechlorinated water to our fishes, but it appeared that it just wasn’t enough. It’s saddening to see our entire collection of guppies just got hit by such an epidemic, but there was nothing much we could do. Perhaps it’s time to bring our fish rearing hobby to another direction…?